Chris Carlsson, executive director of the multimedia history project Shaping San Francisco, is a writer, publisher, editor, and community organizer. For the last twenty-five years his activities have focused on the underlying themes of horizontal communications, organic communities and public space. He was one of the founders, editors and frequent contributors to the ground-breaking San Francisco magazine Processed World. He also helped launch the monthly bike-ins known as Critical Mass that have spread to five continents and over 300 cities. 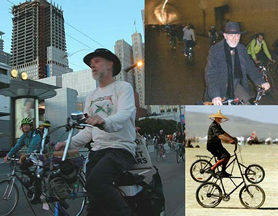 He has edited four books, “Bad Attitude: The Processed World Anthology” (Verso: 1990), “Reclaiming San Francisco: History, Politics, Culture” (City Lights: 1998, co-edited with James Brook and Nancy J. Peters), “Critical Mass: Bicycling’s Defiant Celebration” (AK Press: 2002), “The Political Edge” (City Lights Foundation: 2004). He published his first novel, “After The Deluge,” in 2004, a story of post-economic San Francisco in the year 2157 (Full Enjoyment Books: 2004). Carlsson makes his living as a book designer, editor, and typesetter. He is a member of Media Workers Union Local 100 in San Francisco. He is also recent past board president of CounterPULSE, a San Francisco-based arts organization, where he has been producing a series of public Talks since January 2006. Check his website for updates on this and links to his blog and other activities: www.chriscarlsson.com, or email him directly at cc at chriscarlsson dot com.